Four hundred students who would have otherwise gone hungry, and struggled to concentrate in class, are getting one square meal a day, thanks to the Wits Citizenship and Community Outreach (WCCO) feeding scheme. The feeding scheme operates at lunch time at the WCCO offices at the back of The Matrix. 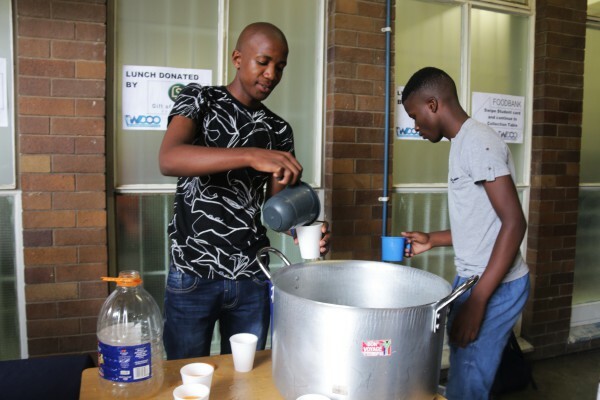 It was started in January after postgraduate student and volunteer, William Mothoa, witnessed homeless and hungry students congregated at the library. “What I saw on campus was scary, I met a guy who told me he hadn’t eaten for two days,” Mothoa says. Mothoa called into Jacaranda FM and related the plight of the students. Listeners of the radio station called in and donated money to his plea. He managed to raise R30 000 which he says WCCO used to buy supplies for the food bank. With the swipe of a student card students are able to receive a meal containing a starch and one protein. One of the beneficiaries is a second-year electrical engineering student who stays at Knockando residence. He can only afford breakfast and supper at the dining hall, and has come to rely on the WCCO for lunch. “The food is fine, at least it gives you something-nyana to fill up the stomach,” the student, who didn’t want to be named, says. The feeding scheme is supplemented by donations from Gift of the Givers, the Wits Food Garden and The Wits Food Bank in an effort to curb hunger on campus. However, the partnership with Gift of the Givers will continue until the end of April. From May the project coordinators hope it will then become self-sustainable. Felix Donkor of Generation Earth says they have been working with Inala and Jozi Food Farmer to ensure that these programs keep running in service of students. “Students, clubs, the university and industry will have to collaborate with their unique strengths as one cannot do it all one. Moreover the number of students requesting assistance with food is on the ascendancy which calls for more concerted effort to alleviate hunger,” says Donkor. “Numbers have swelled because everyone is struggling,” says Karuna Singh of the WCCO. About a dozen students volunteer to help out daily along with social work students but the WCCO still needs more volunteers and donations. Singh says she wishes they had a better space to feed the students as the place they use is not clean. “I just ran out now to tell this truck driver to switch off his engine because there were exhaust fumes everywhere,” Singh says.